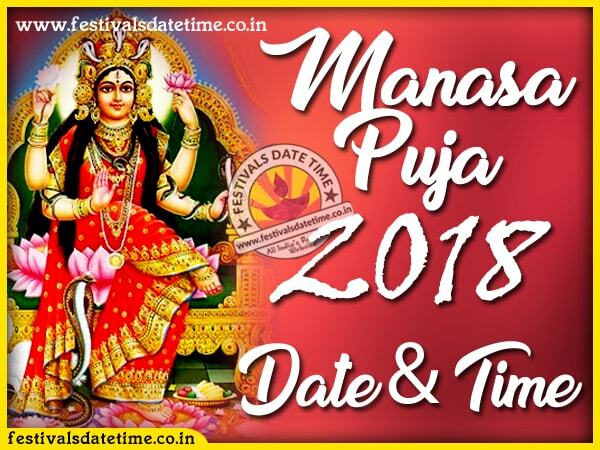 About Manasa Puja : Manasā, also Mansa Devi, is a Hindu folk goddess of snakes, worshipped mainly in Bengal and other parts of North and northeastern India, chiefly for the prevention and cure of snakebite and also for fertility and prosperity. Manasa is the sister of Vasuki, king of Nāgas (snakes) and wife of sage Jagatkāru (Jaratkāru). She is also known as Vishahara (the destroyer of poison), Nityā (eternal) and Padmavati. Her myths emphasize her bad temper and unhappiness, due to rejection by her father Shiva and her husband, and the hatred of her stepmother, Chandi (Shiva's wife, identified with Parvati in this context). In some scriptures, sage Kashyapa is considered to be her father, rather than Shiva. Manasa is depicted as kind to her devotees, but harsh to people who refused to worship her. Denied full godhead by her mixed parentage, Manasa’s aim was to fully establish her authority as a goddess and to acquire steadfast human devotees.